Delayed Soybean Planting? Big Deal -- or No? As farmers wait for the weather to clear, planting may be further delayed due to increased soil moisture from the recent rains. 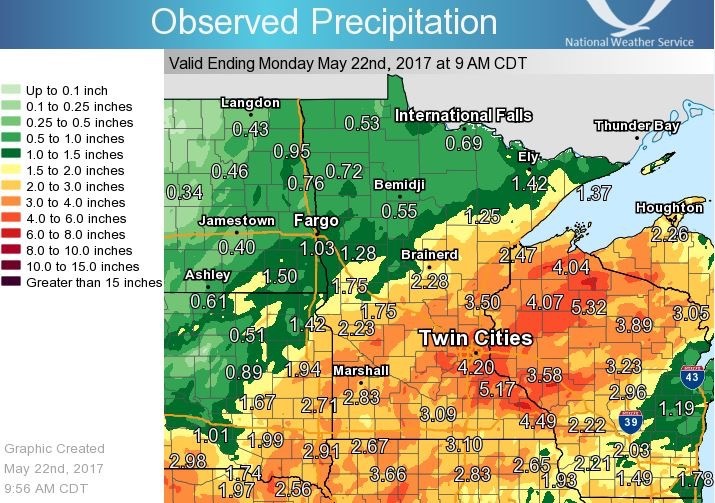 According to the May 21, 2017 Minnesota Crop report, topsoil moistures were estimated to be 72% adequate, and 27% surplus while subsoil moisture supplies were rated at 79% adequate, and 20% surplus. Minnesota farmers did make significant planting progress in May with corn and soybeans, yet there remains soybean acreage to be planted throughout the state. Cool temperatures and precipitation across Minnesota limited farmers to only 2.5 days suitable for fieldwork during the week ending May 21, 2017 according to USDA’s National Agricultural Statistics Service. Although 16% of soybeans have emerged, 28% of soybeans have yet to be planted. This leaves us about four days behind last year’s planting progress. Some of the central, eastern and southeastern sections of the state have only reached about 50% planted. So, what’s the prognosis? What should farmers with unplanted soybeans do? There are a couple of rays of hope out there. First, the 10-day forecast is starting to open up. There are some sunny days in our future. Second, soybeans are able to cope with delayed planting quite well, and yield penalties for late planting can be tolerable. According to a long-term planting date study by Bruce Potter and Steve Quiring at the Southwest Research and Outreach Center in Lamberton, yield losses through May are relatively small. Soybeans planted before June 1 should produce about 90% of those planted by the first week of May, on average. We are probably losing about one third bushel per day with delayed planting during late May. Once planting is delayed past June 1, we begin to see accelerating losses. One should expect yield losses of about one percentage point per day in early June. This would culminate in a 50-60% yield when soybeans are delayed (or replanted) on July 1. As mentioned in a previous Crop-E News (Planting when cold and wet), soybean maturity choice does affect the yield loss across planting dates. Very full-maturity soybeans tend to have the greatest yield potential when planted early, but the rate of yield loss across time is greater. Therefore, by late May, one should not expect a long-season soybean to out-perform a similar variety of shorter maturity. The advantage of the long-season variety appears to be primarily through exploitation of early planting windows. When should a producer switch to a shorter maturity soybean? Conventional recommendations have been to hold soybean maturities until June 10. This still holds for producers who grow soybeans that are well-adapted to their latitude. Producers who have been selecting very long-season soybeans to take advantage of early planting, should consider moderating their maturity choice by late May. They may choose varieties that are typically adapted for their area if they are confident that they can get them in by June 10. Remember, exchanging seed usually puts one at an additional disadvantage, as the original seed selected was a better overall variety with a higher yield potential and better adapted to the specific field. Expect to trade-down. One additional caveat – the yield penalties mentioned above are based on an average year. Due to the recent cold weather, the actual yield penalty this year will be smaller compared to an average year, since the overall yield potential is also lower. Early-planted soybeans in 2017 have struggled and are developing slowly. Beans planted in late May this year may lag behind soybean of years prior, but may not lag far behind those planted on May 15 of this year. It’s been relatively tough all over, so don’t fret about unplanted beans --- yet.